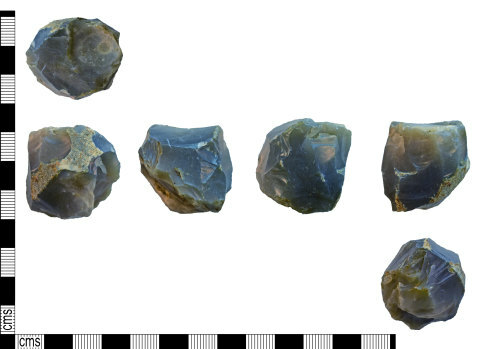 A complete flint Core of Mesolithic date (9000-3450 BC). The lithic is sub-triangular in plan and bi-convex in section. The proximal end tapers to a point and the distal end is flattened to form a striking platform. Both the dorsal and ventral surfaces contain multiple negative scars. The lithic retains minor amounts of cortex. The flint is dark grey in colour with light grey inclusions throughout. The cortex is light brown in colour. Length: 27.56mm, Width: 29.02mm, Thickness: 26.60mm, Weight: 29.4g.